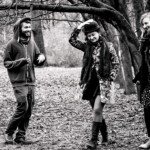 Alpine Dweller is a young trio from Styria and Upper Austria. Alpine Dweller unites seemingly incompatible styles, by merging folk music influences with sophisticated urban songwriting and combining traditional music of distant regions with pop. The trio is able to create a beautiful new music style that entices the listener to experience big emotions with melancholic melodies and then again fragile dreams with tremendous restraint. Flora Marlene Dorothea Geißelbrecht (viola, harp).